A heavy duty spun black iron sheet with a slight rim for lifting and containment. 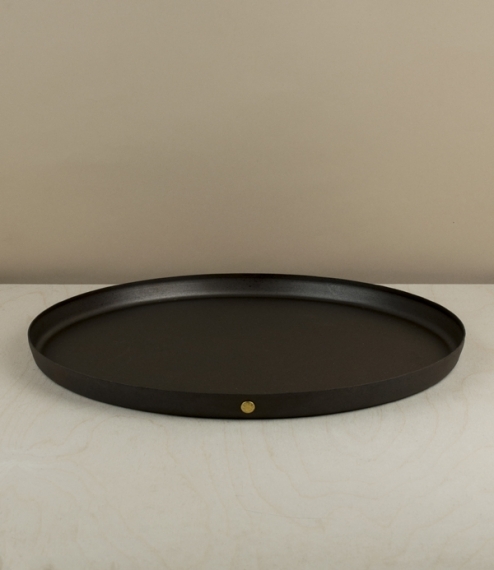 Pre-seasoned with flax oil for a natural non-stick finish, this tray is perfect for biscuits, breads, pastries especially used in conjunction with a baking dome, or else as a tray both for carrying and presentation, hot or cold. Can be used in very hot ovens, safe up to at least 300ºC (572ºF). Hand made in Shropshire by Netherton Foundry, a company committed to sustainable sourcing and local manufacturing.